Available to Order. Estimated delivery is 14 working days. 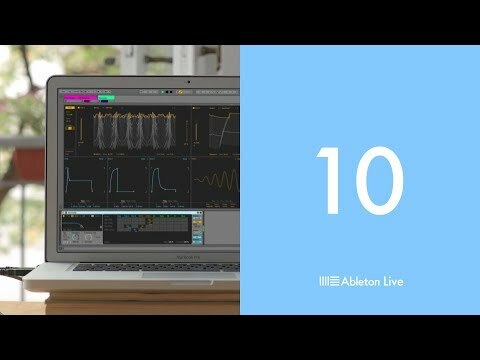 Ableton Suite 10 is an extremely powerful Digital Audio Workstation which is designed for use both in the studio and on stage. Let this software accompany you through every stage of songwriting and performance and you might find your creativity being encouraged by the simple but more than capable workflow and great features such as session view. Being the Suite version of Ableton Live this product includes a wide range of instruments, effects and even more. The latest version of Suite also includes Max for Live for the first time, an extremely powerful tool for creating effects and other devices in Live as well as giving you a wide range of user created devices to quickly download. The most recent version of Suite always brings us some new toys to play with. This time round we have a considerable amount of notable improvements and while some are more "under the hood" there's plenty you'll gain from this version. One of the most exciting additions is the new Glue compressor, modelled on an analog 80s console bus compressor. Great on individual instruments or for making your whole mix tighter, the Glue compressor is a very welcome addition in Ableton Suite 10 and enables you to make more professional sounding mixes easier. The already popular EQ Eight plug in has been overhauled too making it much more usable with even more possibilities. The filters inside EQ Eight have been rebuilt, improving the sound quality and smoothness of the output. Several new features are here too, amongst them a new display mode where you can make the output spectrum appear much larger for quick and easy analysis. Other new EQ 8 features include adaptive Q, the ability to change multiple filters at once and an audition mode where you just hear the selected filters effect. As mentioned, some of the most important changes in Ableton Suite 10 are the ones you might not see instantly. A lot of the inner workings of the software have been altered to improve sound quality and really perfect the (already extremely reliable) software to ensure it can hold up on stage every night. Changes have been made to the iconic Session View too, making it even more impressive. Automation can now be recorded to clips in real time or drawn in for full control over all parameters. A new curved automation feature, present in both session and arrangement view, lets you add smooth curves to your parameters too for professional sounding effects. A new feature for version 10 is an audio to MIDI converter, extremely handy for getting ideas down quickly. Three conversion options are available: harmony, melody and drums. All three do just what you'd expect and allow you to use samples in a new way, for example use your favourite drum break with completely new sounds. This also means you could record a guitar line in and turn it in to a synth or turn your beatboxing in to a full drum kit. The possibilities really are endless with this new feature. All of the changes in Suite 10 are there to help make you work quicker and end up with a more professional result. If you've used Suite before then you'll know how easy to create music in a variety of genres and version 10 makes this an even easier task.